I was first introduced to The Complete Daily Curriculum for Early Childhood by a former public school teacher who is now involved in tutoring students. She recommends this book to all parents of pre-schoolers who want to Sort Of (or officially) start schooling their kids to make sure that they are solidly ready for kindergarten. Published by Gryphon House, I snatched it up to take a peek and fell in love with it. So let me introduce you to our complete pre-school curriculum and tell you why I'm going this route. For starters, the book is divided up into thematic study units. The first unit is entitled "All About Me" and there are "lessons" divided up by subject. First you teach your child about the body as a whole (with picture book recommendations, songs to sing, art projects listed, etc), then about fingers & hands, legs & feet, ears, eyes, mouth, nose, etc. There is a study on families, friends and things that the child likes to do. As mentioned, there are plenty of art and activity books listed for each subject matter so that the parent (and/or the teacher) can select projects that they are comfortable doing with any number of children. There are unit lessons on animals, insects and bugs, food, nursery rhymes, songs and weather. This book really seems to have it all! Furthermore, the book also helps you to choose activities and ways of approaching each subject matter in a way that will help children with different learning styles to best grasp the concepts. There are suggestions for auditory, spatial, and kinesthetic learners as well as others. 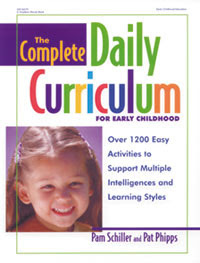 The authors of this curriculum, Pam Schiller and Pat Phipps have really done a thorough job of creating a practical straight forward book which anyone could use. I really appreciate how everything is laid out in a logical and orderly manner, while at the same time heavily promotes creativity and fun! If you are at the start of schooling, as we are becoming close to being, I highly recommend this book. Even though Bookworm1 is only 2 1/2 we loosely worked our way through the My Body section and it was fun singing and playing together while learning something useful. Everything you need in one book? No joke?! Nope, no joke! The teacher who told me about The Complete Daily Curriculum was very serious - this is a great package of a book and I'm excited to make good use of it. Would this book be good for my already academically above average 3 1/2 year old? We want to start homeschooling in August after she turns four. But right now I feel like I should be doing stuff with her as well. However, it winds up being random and unstructured which i don't like. I'd really like something simple that's easy to follow but won't bore her. I tried contacting you through your own blog as well, but if you want to pop me an e-mail and tell me where your daughter is at, I"ll be happy to look through the book and give you a fair answer. This sounds like a fantastic book, Carrie! I might have to look into getting it for our homeschool next year! I recently got this book as well as some companion books for my three year olds. It is sitting on the shelf and you have encouraged me to pull it out and really use it! Thank you!